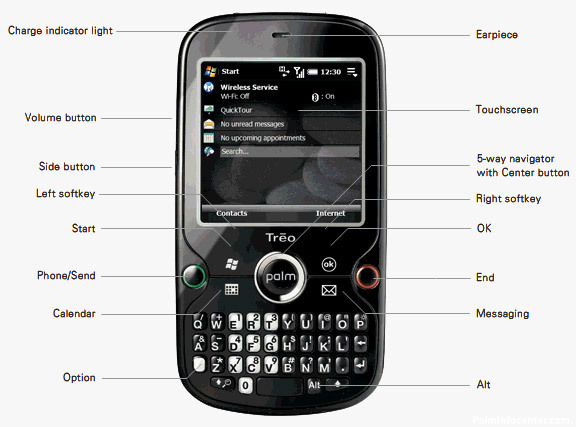 A number of images of a new Palm Treo Pro have been dug up and posted online. 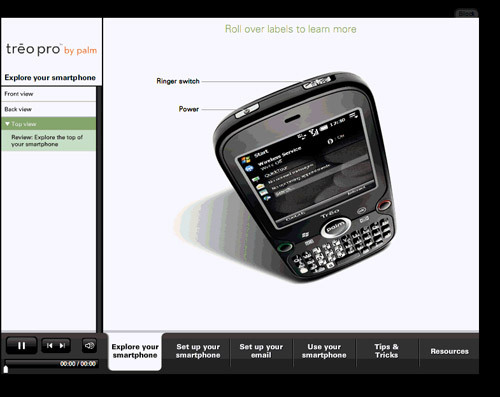 Forum member scottymomo at WMExperts poked around Palm's Learning site and found a unposed flash tutorial of the unannounced new Treo. The Treo Pro appears to be the official name of the previously leaked Treo 850. The earlier blurrycam pics match up with this new set and also fits the description of the code-named Palm Drucker, which was leaked back in January. The last set of rumors on this device pegged it as a Windows Mobile 6.1 powered Quad-band 3G GSM phone with Wi-Fi, GPS, Bluetooth, a 400 MHz processor and an approximate thickness of around ~.55 inches (14mm), a noticeable reduction from Treo's past. Aside from the black and sleek refreshed, Centro inspired design, new details revealed from this set of pics include a 3.5mm headphone jack, a dedicated Wi-Fi button, an unspecified but presumably a microSD expansion slot and a microUSB connector. Also present is a "flush" touchscreen, the usual ringer switch and a new button arrangement. Now someone has to "accidently find" the manual for Nova, right? That they dropped the numeric title for an actual word. This looks like a real player for the enterprise market. Be sure to tell the enterprises that, because they keep on "going RIMM". Active Sync is attractive too. Our organization is not big at 1100 employees but it has no BB server employed. It's MS Exhange via Active Sync or nothing. It is more cost efficient and requires less support. Palm Inc. stock has almost doubled in the last 55 days. Herein again is the beginning reasons why it will double again in coming months. And if they can successfully deploy a solid POS 2, it will do more than double again in the next 12 months. 1. evaluating a company/stock performance by picking selective past time periods in an attempt to validate your conclusions is called data mining and it really shows your bias and you lose all credibility when you do so. 2. no, palm stock has not almost doubled in the last 55 days. try to be honest, objective, and critical for once. Gekko, your bias is obvious. Palm stock almost closed at $8 today. In June it was below $5. Sorry. i have no bias. i just bought a centro. hardly even close to a double, despite selective data mining. My point is not about stock fishing but that investors see Palm turning around too. And during a time when many other stocks have been struggling. Palm stock is growing during a down cycle in the market overall. Long standing Palm stockholders are certainly in a world of hurt still. However, people who saw Palm stock as a good risk buy following the transitions last year are happy with 60% or higher profits. That base looks awfully big to house only a micro-USB and 3.5mm jack? Looks more like the Athena lives. Also, if this name stands, then it seems that WM truly will become the Treo (enterprise focused?) line, and Nova devices (if ever) will come at another niche'. Finally, and echoing the same broken record story since 2001 ... why all the wated real frontal estate around the screen? When will these folks ever learn that display real estate is at a premium on handhelds / smartfones? Gosh, I just played around with the iPhone 3G again today @ ATT, and not only marveled at the interface, but THAT screen!!! In a ultra-thin device no less! Will somebody over there wake up and design something that stretches the viewing area to the absolute borders of the frontal area already?!? Let's see now, iPhone has been on market for > year and Palm's 850 Pro is yet to show, and they still don't get it. Somebody get a clue over there and folks will camp out waiting for the release!!! Your #s keep changing with every post. Yes, in a perfectly defined gap of time a tanking stock actually has rebounded. They always do whether recovering or spiraling to zero. Unfortunately for stockholders, perfectly defined gaps of time only work in the past. The only two difficult things about stock investing is when to buy and when to sell. They don't let you trade based on last months charts, but only on the fly. I'm happy for anyone who has gotten a bounce recently including you. I hope it's a trend even greater than your projections. I hope against hope that Palm turns things around. That being said Gekko is absolutely positively correct in his definitions and comments. IMHO, you should just chalk it up as a learning experience and enjoy going forward. People who have been investing as long as you have been living know better than to give a seconds attention to this kind of thing. Wooohoooo! Palm, you amaze me. A micro USB and 3.5mm audio port! Say it isn't so. If you keep listening to us round' here then there is no telling what might happen. I'll believe it when I hear it in my Skullcandy buds. Even if it's a lie, I love it. Way2Go! Hey, and I forgot to mention that the back looks solid. Is this a non-replaceable cell here aka iPhone? Uggggh, unless they packed some horsepower in it. The back looks like it will come off to access the "reset button"
2. If the 3.5mm stereo headphone jack spec is NOT a typo and it's really NOT a conventional 2.5mm jack designed to keep the legacy wired headset crowd happy, then that's a HUGE IMPROVEMENT! If it's REALLY there then MAD PROPS & thunbs-up to the Podfather for ramming that one past Palm's beancounters! 3. I'm stunned to see the reset button back. I wonder if the carriers complained about it (ie some customers didn't like having to take their battery out to reset their device)? 4. IR is kind of surprising but a welcome inclusion. I guess Palm wants to keep their realtor customer base happy! 5. 400mhz CPU is nice. Not going to set the market on fire but it should be enough for a slim 320x320 device. It's 67mhz of a bump up from the 800w's CPU (plus the usual software optimizations from being a new WM build) that it should drastically lessen the performance hiccups that Adama & Ryan commented on. 1. The downward-pointing stylus worries me tremendously. I can just see this thing coming loose over time ( a problem on the older 6xx/7xx series Treos) and sliding out if one doesn't wrap a piece of masking tape around the stylus barrel. I'd rather see the stylus in its conventional spot up top and the wi-fi button/power button/IR port moved to the bottom if necessary. 2. I'm worried about battery life. I a guessing the standard 1150mAh Centro/800w battery makes a triumphant return here. This thing really needs no less than 1500/1600mAh, especially with the faster CPU and wi-fi. GSM vs. CDMA isn't gonna help that much. 3. That d-pad looks atrocious. It looks mildly uncomfortable for basic navigation and nigh unusable for any kind of gaming. Once Apple starts getting "real" game developers onboard, I wouldn't be surprised to see phone/smartphone manufacturers paying attention to their devices' gaming capabilities to try and remain competitive. 4. I'm worried we're gonna have a real "slick" device here (ie hard to hold securely). Where's the soft-touch rubberized paint!?! Best looking device? You did not just leave out the Schiffer Vx did you? I'm wondering if the battery is removable. TooMuch might be right @ the back coming off, but Palm may be slicing all the thickness it can? I'm like you and fear an anemic battery tho. Paint looks similar to Centro which is OK, but not as good as the 755 etc. This really is an attractive design tho. Original Drucker rumor had a 1500mah cell. Thats about the minimum std for this. thankfully it's at least GSM. The 3.5mm headphone jack is HUGE! I think this device is ahead of most other keyboarded WM phones, and is finally competitive with the Blackberry Bold. It will hopefully do well. I think I just saw a pig fly past my window. A 3.5mm jack on a Treo? Latest round of pix shows back removing for battery, reset & SDm. and it has an on/off button too. wow. Gekko, you're just jealous. Wait for the Centro Pro leak. Palm Hardware Team: We can haz 2.5mm headphone jack? Rubinstein: WTF? NO can haz!!! a "nothing special" device lost in a highly competitive sea of commoditized winmob clones. too little, too late. hardly a game-changer. Unlike the 800w (which looks even sadder in person than it does in photos), this is quite the stylish little number. Too bad they couldn't squeeze an 800w-style keyboard in there. Well, I wouldn't be quite so harsh as Gekko but for the most part I do agree. A year ago, this would've set the industry on its ear (heck, even the 800w would've been phenomenal HAD it been when it SHOULD have (supposed to?) been released in summer '07). 6 months ago, this "Pro" would've been a very strong entry (even with WM 6.0). But now it's just a slightly better-than-average WinMob handset. For a TREO, it's superb. Definiitely the best looking & best spec'd Treo ever. But what is a strong entry relative to Palm's other feeble offerings still doesn't offer enough to stand out from the pack of WM clones and RIM's increasingly strong designs. Now, Palm, bring this thing out with a "smile" keyboard, some kind of POS (either a highly tweaked/optimized Garnet or NOva) & in CDMA flavor and you'll have perfected the SSS (small square screen) QWERTY candybar phone. Then please proceed with all possible haste to large-screened phones! P.S. This is defintely the first smidgen of the Rubinstein influence. Who wants to be that Palm had a mediocre 800w-style GSM successor in the works for the 750 and Rubinstein said "make it music-friendly), thinner, more stylish, and juice up the CPU"
1. do you see this thing taking business away from the iphone? i say no. 2. do you see thing thing taking business away from BB? i say no. so who is going to run out and buy this thing? i say a small niche. love it or hate it, BB and now iphone have completely changed the game. 1. For users who absolutely insist on unlocked GSM handsets and want a physical keyboard (the "world traveler roadwarrior" types), I see a decent market. 3. The usual batch of Palm OS converts may want to jump ship to this one from ,say, a Treo 650/680/Centro if they simply love Palm "stuff" and the formfactor. Remember, Palm doesn't care if you stick with FrankenGarnet or Nova or WinMob. They just want you to buy Palm as in "Palm Inc.", not "Palm OS". Basically, if this Pro/850 is attractively priced (ie undercuts iPhone & BB Bold in every market) then I can see it picking up some Centro users. cannibalizing palm's current customers doesn't help "too much". i doubt that this device will stops the bleeding/defectors but either way, palm needs to GROW the business and STEAL market share from competitors. my prediction is that palm will continue to clunk around and languish as an "also-ran" in low margin commodity hell for a few more years with their centro/winmob me-too options. they'll stay in business as an independent until someone decides to buy them for strategic reasons - not for the cash flow or enterprise value or technology or brand. and then the company/brand will be slowly and quietly assimilated before it disappears forever. Watch it some with some sort of cross-promotion for the Celio Deadfly - errr, Redfly. I *still* say that's the beta test device of a while back. If they price it right they could have a winner. Might lose them money like the Centro apparently is, but they'd have a winner! No, I certainly don't expect them to price it right. Do guys are starting to look like fools predicting Palm's descent into oblivion! The predictions are that Palm is going to the moon, Alice! No, instead we're observing Palm's descent into oblivion. "No, instead we're observing Palm's descent into oblivion." Why? You must be real bitter and have alot of time on your hands. palmit's profile says he's been here since 2002? Then why doesn't he know better? mikecane - You are right, I should know better. Is Palm perfect, no way. But I do think they are trying to turn it around and we will see what happens next year as far as new OS/phones. Palmit, if they turn it around, it will be in business history books. In a better way than it already aims to be.